Anno 2205: To The Moon. Most single player games are played either for relaxation, escapism or a combination of both. However there are some that feel more like running a marathon, igniting your mental faculties in such a way as to leave you exhausted by the end of it. StarCraft and other RTS are like this, requiring concentration far beyond that of any other genre I’ve played. 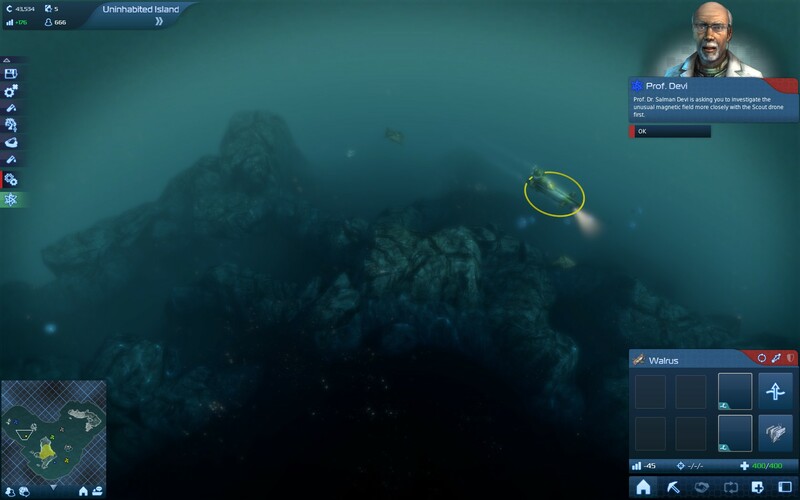 Anno 2205 requires a similar level of concentration however, instead of RAW APM and macro, it instead requires you to constantly recalculate the finite balance of the numerous resources you have to manage. One wrong move can send you on a downward spiral that can be hard to pull out of, or send you on your trajectory to corporate supremacy. Anno 2205 predictably takes place in the future, some 135 years after the previous instalment in the series. In this future the Earth has become starved for energy and other precious resources and thus has turned towards the Moon in order to save it. You are the head of a fledgling new corporation who has been accepted into the Lunar Licensing program which aims to free Earth from its current energy bonds. Your goal is to establish a fusion reactor on the moon and transmit that energy back to Earth, no small goal for a company that just established its first warehouse. Along the way you’ll have to establish global trade routes, fight off those who would thwart you and ensure that your company remains financially viable so you can continue expanding your empire. The graphics of Anno 2205 are a marked step up from its predecessor with a whole new engine powering a complete overhaul of the graphics and UI. Gone is the semi-dreamlike aesthetic which has been replaced by a crisp, detailed world. The typical Anno stylings are still present however so if you’ve played any of the preceding titles it will still feel familiar. These upgraded visuals do come at a cost however as even my machine would start to sputter and spurt whenever I hovered over a particularly dense part of the world. Still it rarely became unplayable but for those who might be on lower end hardware long games are certainly going to be a struggle. 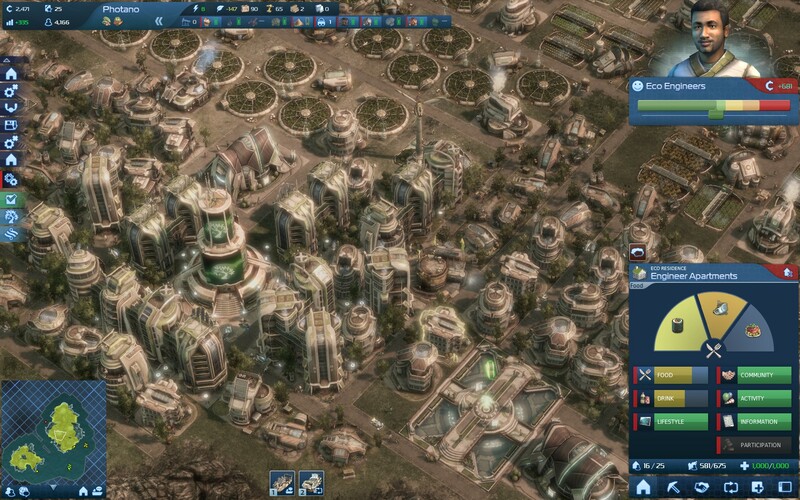 Anno 2205 retains the same RTS/city building hybrid game play that its predecessors had however many changes have been made in the name of streamlining the experience. Instead of managing trade routes within a single map everything is shared instantly. You still have trade routes to manage however they’re at a more macro level between areas. Anno 2205 also guides you through the various trials and tribulations that it will throw at you, telling you what critical shortages are impacting you and when you should investigate something. There’s also some new mechanics included to make sure that you don’t find yourself in an unrecoverable situation, however it’s still up to you to get yourself out of it. The combat has also been relegated to its own separate encounter, meaning you don’t have to manage your military and trade all in the one spot. Other than that however Anno 2205 plays out much like its predecessors did, requiring you to make sure you have enough of everything so your employees stay happy so you can remain profitable. Like most similar games Anno 2205 feels extremely overwhelming on first play as there is just so much you need to learn and understand. Thankfully though the tutorial is great at stepping you through the various goals you need to meet in order to reach the next objective. You are, of course, free to ignore that completely and pursue your own objectives independently however Anno’s rather linear progression means that you’d be wise to follow its instruction. After a while you start to get a feel for the impact that your actions have on your world and that allows you to start building out a plan of attack for progression towards the next goal. For instance your advanced resource colonies (Arctic and Lunar) are almost always going to be loss-leaders. I tried extremely hard to make them profitable however they just never seemed to get into positive territory. The main tropical ones however can have you rolling in cash in no short order, meaning you should focus on building them out as much as you can whilst only building the minimal components in the others in order to support them. Then, once your cash reserves are high enough, you can look towards building them out a bit more in order to support the next goal or tech tier which will then allow your main colony to thrive further. Attempting anything else seemed to lead to me running into negative cashflow territory quickly, something which torpedoes any kind of growth you were experiencing. Thankfully when that happens the game, at least on its default settings, is generous with the bailouts it gives and the conditions that are imposed on you when they’re given. This means that, should you find yourself in a dire situation, you’ll get lump sumps of cash from the Lunar Licensing program in order to continue your work. Gone are the days when a downward spiral in Anno meant you’d be restarting your game, something I was thankful for given I flirted with bankruptcy more than once. Past a certain point though credits no longer matter and it all comes down to the resources you can generate. In the beginning this all comes from simply building as many things as you can, however that will quickly have you running out of credits and space. After that point you’ll need to engage in combat missions in order to get upgrade materials to make your resource generation more efficient. These missions are essentially micro exercises, pitting your combat fleet against a torrent of enemies and objectives. They’re not especially difficult although they do have a gear check requirement for the higher levels which can’t really be overcome with skill alone. Still whenever I found myself wanting for resources it didn’t take long to get them, something I was thankful for given the rather huge time sink requirement games like Anno have. Removing this aspect from the core game is a welcome change too as it always felt far too fiddly having to manage all those aspects together all in the same map in previous instalments. Indeed whilst many Anno purists where crying foul over the streamlining I feel like it was the best thing about 2205. 2070 always had far too much going on with so many variables to track in order to make sure that everything was working as intended. 2205 by contrast keeps you informed of what’s going on without being too heavy on the information side and shows you exactly where the deficiencies are coming from so you can address them directly. Sure it might be a simpler game, one that’s not so mechanically complex, but there is such a thing as too much complexity and that’s definitely how I felt with 2070. Anno 2205 is a great evolution of the series, bringing with it streamlined gameplay and updated visuals that really ramps up the Anno experience. The core game remains largely the same, with the resource balancing act still being the key to everything, however it’s a lot less mentally exhausting. The various other aspects have been carved up into their own little sections, further reducing the mental burden. You’ll still be saddling up for quite some time however as reaching the ultimate goal took even this seasoned gamer numerous hours to complete. For fans of the series or just this type of game in general Anno 2205 is a great title, one that’s sure to provide countless hours of addiction…I mean entertainment. Anno 2205 is available on PC right now for $59.99. Total play time was approximately 9 hours. Planetbase: They’re All Dead and It’s All My Fault. For some reason the gaming community has thrived on titles that are, for want of a better word, incredibly brutal. The trend started to take root after the first Dark Souls game which prided itself on not holding the players hand, nor caring if it proved too difficult to be enjoyable. On first look such games were the antithesis to the base ethos of games: that they be fun above all else. However such games, when played well, provide a sense of satisfaction beyond those who are perhaps a little more forgiving. Planetbase is a city building game in this vein, putting you in control of an offworld colony which, if managed incorrectly, will have dire consequences. You are the invisible hand that will guide these colonists to establishing a viable colony. Upon landing on your planet of choice, with your colony ship full of resources and a handful of aspiring colonists, it’s up to you to give them everything they’ll need to survive. In the beginning their needs are simple, oxygen and water being all you’ll need to make it through the first night, but after that you must find a way to provide them everything they need. Like all closed ecosystems though these things need to be created in balance and should that not be done you will quickly find yourself facing catastrophe. Will you be the leader that leads your colony to success? Or will you become the agent of their destruction? Planetbase has that Unity-esque feeling that most games developed on the engine have. It’s hard to quantify exactly what it is but like Flash games before them they all seem to share a similar visual style that became something of a trademark. This is especially true for Planetbase which feels like the colonist version of Kerbal Space Program. The simple visual style is partly due to performance reasons, something which could become a concern with larger bases. The visual simplicity also helps a lot with making sure you can keep track of your base layout, something which becomes increasingly difficult as your base grows. Overall, whilst Planetbase won’t win any awards for its graphics, they are far more than sufficient and are perfectly suited to the type of game that it is. Your goal in Planetbase is simple: you have to build a self-sustaining colony on a new world. As you click your way through the tutorial this seems rather easy, there’s a logical progression to the structures you need to build in order to satisfy the growing needs of your colonists. However once you’re in the real game it’s easy to forget a critical step which leads to the untimely demise of your entire colony (like the above screenshot, taken not 5 minutes into my first game, can attest to). Like all city building games there’s numerous resources that you need to collect, create and manage in order to ensure that everyone in the colony has everything they need. A lack of resources in one place ultimately leads to issues in other areas of your colony and, without proper treatment, life ending consequences. The game may warn you of your impending doom every so often but that can often come too late, the alarm bell serving only to inform you of the inevitable. Getting through your first night sounds like an easy enough challenge but it’s one that’s incredibly easy to get wrong. Should you fail to build your power array and storage too late you won’t have enough to make it through the night. If you forget to build your water extractor you won’t be able to generate enough oxygen, asphyxiating everyone before they have a chance to build the life saving solution. Thankfully once you’ve figured out these challenges (which are all addressed well enough in the tutorial) surviving the first night becomes child’s play, but the game past that point still provides a significant challenge. Past the first night your goals turn towards building all the components you’ll need for self sufficiency and that means generating many of the required resources yourself. The first two major ones you’ll need to create are metal and bioplastic which allow you to create all the structures you’ll need. For most players metal is the first roadblock that they’ll encounter as it’s the first thing you run out of and one of the harder ones to produce. There are several strategies to deal with this (and I’ll talk about my approach a bit later) however it’s likely to be the main resource which keeps you back for a long time. Once you’ve got a production line of these two resources going the pace of the game slows down significantly as you look towards planning your future expansions. Typically the next issue most people run into is food as your colony gains more and more people. What was interesting about this though is how many factors can influence the simple problem of not having enough food for everyone and every single one can mean people start going hungry. Not enough biologists to tend to the plants? They won’t make enough food. Not enough mealmakers in the canteen? People will have to wait for meals and there might not be enough to go around. Didn’t monitor the number of colonists you have? Keeping the landing pad open to colonists constantly might not be the greatest idea as your food production might simply be unable to cope. It took me a good 3 hours to get food working sustainably and even then it wasn’t the most efficient process. Indeed if you really want to succeed at building a colony then you have to start thinking in much broader terms from the very get go. Whilst the smaller structures are far cheaper and quicker to construct they are by and large incredibly inefficient. The greatest example of this is the biodome with the smallest one only allowing you a third of the number of plants of the largest but costing far more in relative terms. This means that, if building a big colony is your goal, you’ll have judge which buildings to build big right off the bat and which to hold off on. For me it took a good 6 hours of play time before I reached this point and that’s when I was able to finally build a colony that wasn’t always at the brink of disaster. Once you’ve got that all sorted then the final challenge you’ll face is getting the layout of your base right. Whilst this isn’t as impactful as the other resource challenges I’ve mentioned before it is something you’ll need to consider as your base grows in size. Placement of things like oxygen generators, processing plants and high traffic areas like bunks and canteens can radically impact the efficiency of a single colonist. If you get the layout wrong most of the time it just means progress is a lot slower than it can be but can sometimes lead to base destroying issues. One of the best examples I had of this was having one of my bunkers too far away from an oxygen generator which, when it got full at night when people went to sleep, meant that it ran out of oxygen. Despite all these challenges though Planetbase managed to grip me in a way that few games have, tapping into that part of my brain that needs to know how this complicated system works so I can exploit it. Indeed whilst it took me 8 hours to reach 100 colonists I barely realised I had spent that much time in it, forgetting myself for hours at a time whilst I watched my little puppets go about their daily lives. There were some frustrating moments of course but they are the kinds of stories these games thrive on, those moments where a lapse in concentration or missing component ends up having unintended consequences. It may not be for everyone (unless a brutal version of Sim City is your cup of tea) but for those of us that thrive on challenges like this it’s definitely worth playing. Planetbase is available on PC right now for $19.99. Total play time was approximately 8 hours with 25% of the achievements unlocked. 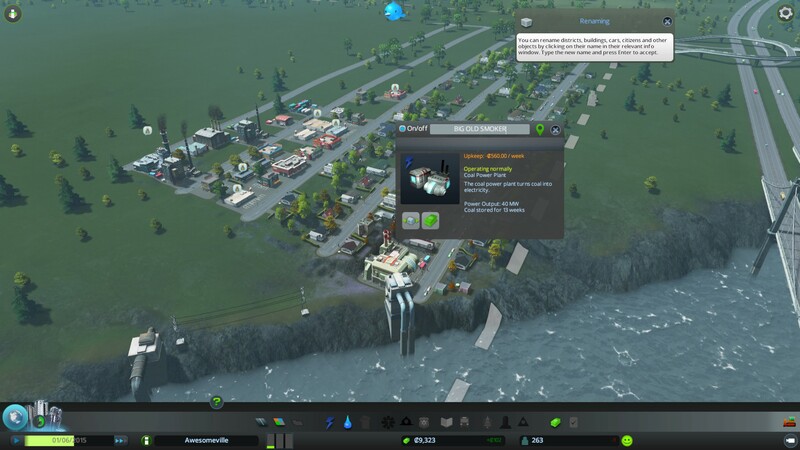 Cities: Skylines: I am a Generous Mayor. There are some genres in which few dare to tread for fear of being crushed by the long reigning champion. For city building games there was really no comparison to Sim City, a game that had been around for decades and had captured the hearts and minds of a generation of gamers. However their last release, Sim City 4, showed that even the mighty can fall and the community began looking for alternatives. There have been others that have recieved some praise, like Banished and Anno 2070, but they never tried to beat Sim City at its own game. Cities: Skylines is a new entrant into the city building genre and it takes direct aim at the crown, going right at the foundation of what made Sim City great. Despite its namesake Skylines is not the next instalment in the Cities series of games (which are developed by Focus Home Interactive) instead it comes to us care of Colossal Order who’s previous titles are the Cities in Motion series. Essentially these were cut down versions of what Skylines looks to achieve, being focused solely on the deployment and maintenance of subway systems in famous locations. Skylines is then a natural progression for Colossal Order, taking their lessons learnt from the mixed reviews their games received and aiming high in the wake of Sim City’s failures. Skylines is built on the ever popular Unity engine which means, as usual, it has a very similar look and feel to other titles that have been released on it. For a city building simulator this isn’t much of a bad thing as you’ll spend the vast majority of your time at a birds eye view. That being said close inspection of my screenshots from both games shows a pretty similar level of detail with the main difference being Sim City favours a light and bright colour palette whilst Skylines is a bit more muted. Indeed comparing both of them it feels like Skylines simply directly ripped off most of the visual and interface elements from Sim City as even the order of the bottom row is identical. The layout works however so it’s hard to fault the imitation but usually it comes with just a touch more subtly. As you’d expect Skylines is a city building game, one where you start out with nothing and have to build your way up to a grand town with thousands of citizens. The controls and mechanics will be instantly familiar to anyone who’s played their fair share of games in this genre, especially anyone who’s spent even a small amount of time with Sim City. You’ll drop down roads, zone areas for certain types of development and deploy services that your citizens needs. Interestingly most of it isn’t accessible to you right at the start, instead the game slowly unlocks things as your population increases. Considering there’s no real tutorial to speak of (those hints don’t really count) this helps in understanding what each of the services does and where the best place is to place them. On top of this Skylines boasts an AI that doesn’t do the things that made Sim City 4 such a chore to play however it still has its own set of quirks, some of which are fun and others which are downright confusing. 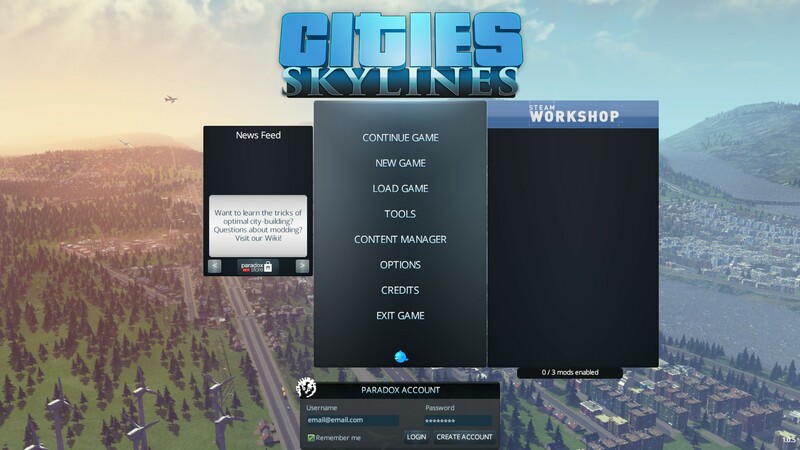 Like all city building games Skylines has an optimal configuration for the roads, facilities, zoned areas and transportation but what that is can be a tricky thing to decipher. 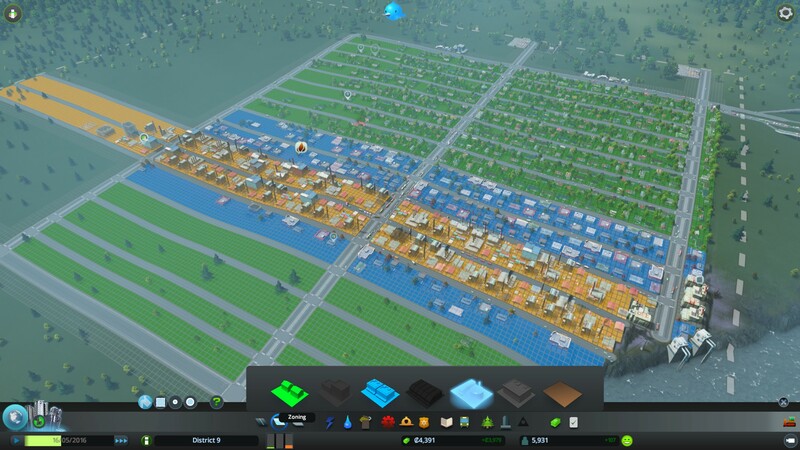 My first couple towns, which were centred on a main arterial with small roads coming off it, worked reasonably well at the beginning but quickly fell apart once the population started ramping up. The configuration below seemed to be the best one I could come up with, using long main roads without many intersections and having side roads come off them. The main limiting factor is the fact that zoned areas need to be next to roads so there’s only so much space you can pen in. I wholly admit that this was me trying to solve the transport problem with roads alone as once I added in metro lines things seemed to get a lot better. There’s a few quality of life features in Skylines that makes your time a little easier, like power jumping from adjacent buildings so you don’t have to run power lines all the way through your city to get it going. The same can’t be said for other services though and so you’ll spend much of your time laying water pipes and other various bits of infrastructure to expand your city. That’s not terribly laborious however it does start to lose its lustre after a little while. It would be nice to be able to create patterns that you could stamp down, something which would form its own little mini-game of developing the best city cells to use for your larger deployments. Thankfully that’s something that might end up happening thanks to the already thriving modding community that’s sprung up around this title. The city simulation seems fairly robust with things behaving how you’d expect them to. It’s a little more logical than what I remember Sim City being with things like the size of the road mattering when you place down a fire station or university. This adds a little more complexity to the city planning aspect of the game but it’s also far more rewarding when you manage to place a single building that then covers your entire city for that particular service. The AI actors are also not functionally retarded and perennially homeless like their Sim City brethren were, going back to the same homes each night and not taking the least cost path to everything all the time. This means that you can stack certain services on top of each other to service a particular need, something you just couldn’t do in Sim City 4. As to whether Skylines is “the game Sim City should have been” well in all honesty they both play very similarly, Skylines just has the benefit of the hindsight gleaned from the last failed release of its competitor. The main gripes (poor AI, can’t expand, always online, etc.) have all be addressed but they were things that weren’t above being fixed in Sim City anyway. I do like the potential the modding community has though as that could extend the life of this game well past anyone’s current expectations. Indeed just looking through the mods now shows many solutions to the issues currently plaguing players and some interesting concepts for improving some of the core game mechanics. Which, if I’m honest, are where Skylines is the weakest. Try as I might to understand why certain things are happening in my game, like below where there are dozens of buildings lying abandoned, I can’t for the life of me figure out what’s going wrong. Sim City got around this problem somewhat with the advisors, something Skylines attempts to do with the tweet roll at the top, however it’s hard to trace problems to their root cause when all the information you get is “This building is abandoned!”. I know its hard for smaller developer houses to invest heavily in tutorials or helpers like this however this was what made me stop playing as I really could not be bothered hunting around forums to figure out how to stop buildings from being abandoned, make commercial places produce more goods or the bloody lumber yards from burning down even though they had 2 fire departments right next to them. 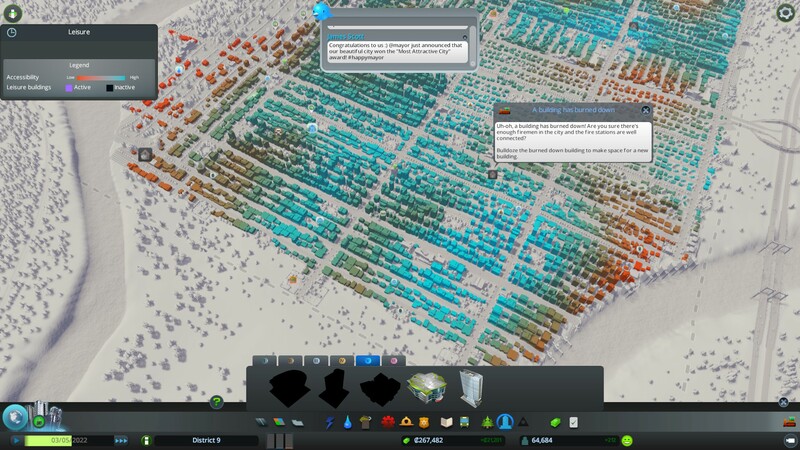 Cities: Skylines does a great job of taking the fundamental ideas that Sim City 4 attempted and addressing every issue that the community had with it. 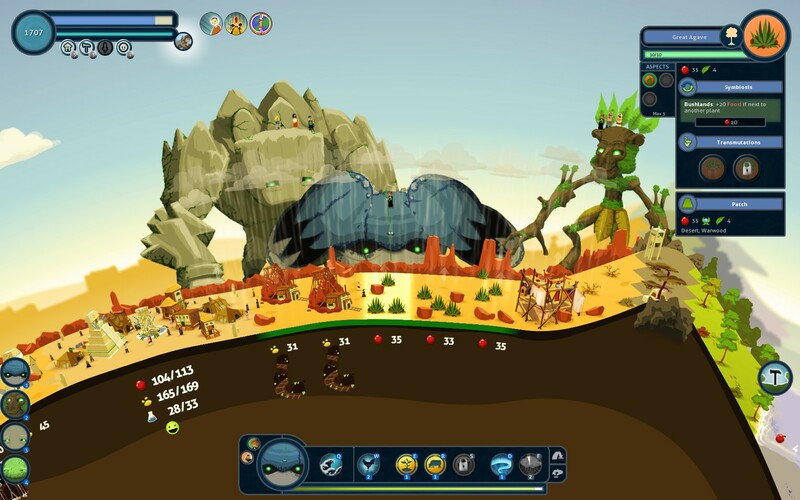 The resulting game is something that has the same look and feel of its elder genre brethren but has many of the features the community wanted in it. That doesn’t necessarily make it the game that Sim City should aspire to be, indeed Skylines lacks any real originality or direction to where it might be going in the future. It’s a solid title, one that plays a heck of a lot better than Sim City 4 did, however it’s derivative and the onus is on the community to take it in new and strange directions to help differentiate it from its main competitor. That being said it’s still enjoyable to play and most certainly worth its current asking price. Cities: Skylines is available on PC right now for $29.99. Total play time was approximately 8 hours with 36% of the achievements unlocked. 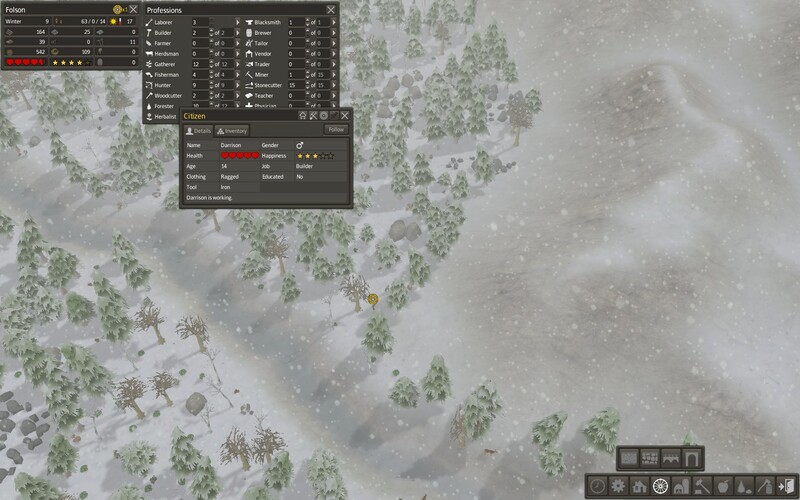 Banished: Life is Hard, The World Uncaring, Yet I Continue On. City building games are a lot like open world and sand box titles, as whilst they might contain some form of over-arching narrative much of the true story of the game emerges from your interaction with it. I’ve avoided the truly open ended games for the most part, primarily due to their seemingly endless beta states, but that’s not to say I haven’t been intrigued by the stories they generate, far from it. 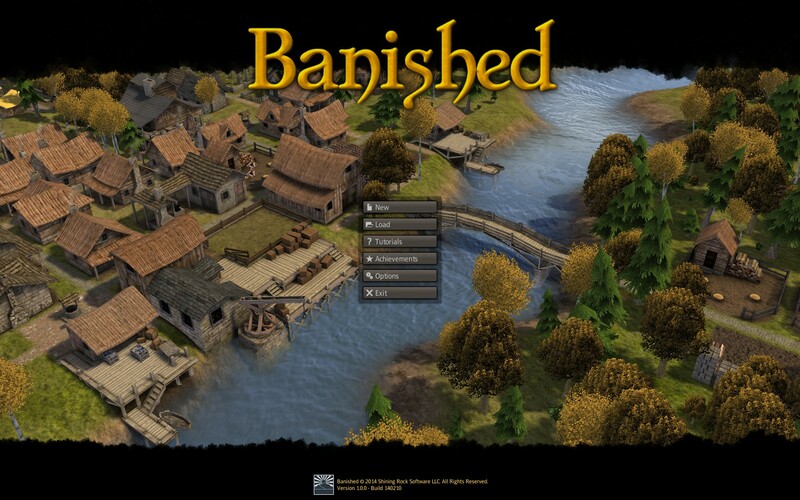 Thus when the tales of people’s experiences with Banished started to percolate through the Internet I was intrigued as the punishing mechanics led many to give up in frustration, only to come crawling back the next day. I feel much the same way and the lack of a pre-determined win condition only made it worse. Exiled from your home town you find yourself in charge of a group of villagers who need to make a new life for themselves. You start with little more than a pile of resources, somewhere to store them and a desire to not die in the first winter that will come soon enough. 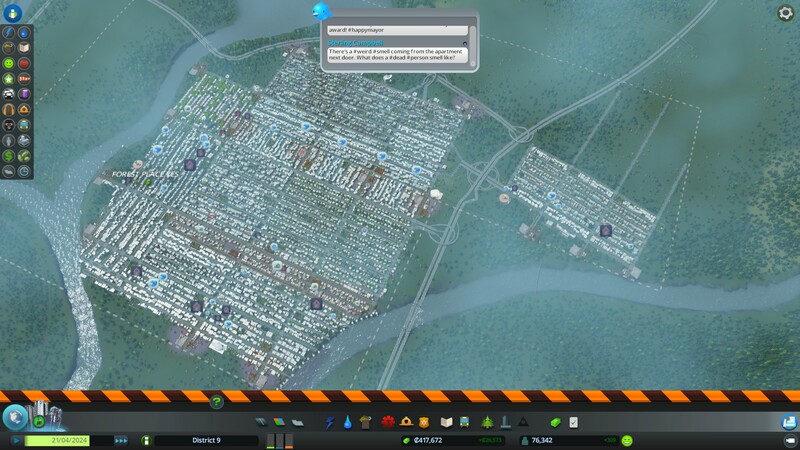 Over time however the challenge shifts from simply surviving to keeping your town functioning, making everyone happy and ensuring they have everything they need to keep subsisting. The longer you play the more intricate and delicate the equation you need to balance becomes as a mistake in one area can have effects that ripple far beyond where you think they did and, if you’re not well prepared, devastate your town. Like most games which have a tendency to generate a lot of on-screen elements as they drag on Banished’s visuals are a relatively simple affair although they do look particularly nice when zoomed all the way out. Many of the buildings have a very similar look and feel about them, even though there is a bit of variation in the house models to break it up a bit, which can lead to some confusion when your town is tightly packed with numerous structures. It’s relatively easy to remember where you placed important buildings though and often you won’t need to hunt around for them anyway. That being said there does seem to be some notable slowdown when you’re scrolling around, even in the early stages when there’s not much on screen. This may be due to my preference to playing on 5x speed, however, although I neglected to test that out. 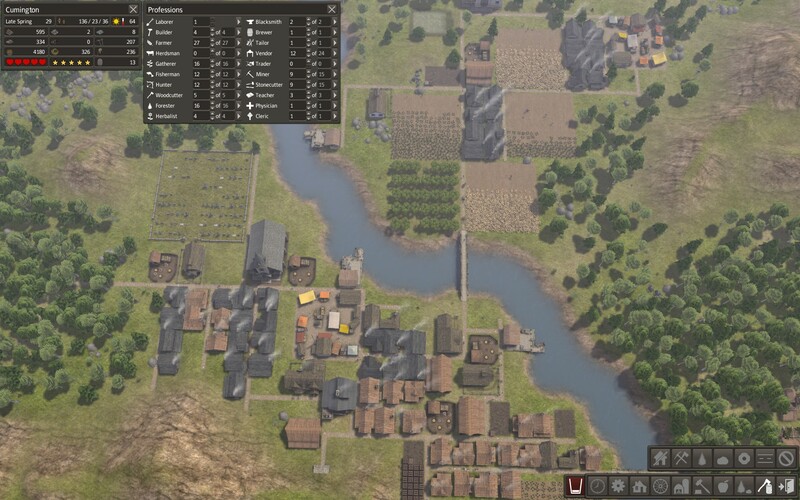 Banished is a city building game, one not unlike Anno 2070 where you’re on a never-ending quest to find more resources in order to grow your population so you can…get more resources. Compared to other city building games that come with tech trees and other intricately layered mechanics Banished is actually quite simple, mechanically speaking. You can essentially sum it up as needing to provide life’s basics to a group of people (food/water/shelter) and doing so in a way that allows the town to grow and prosper. Typically this revolves around finding ways to overcome particular resource shortages with the most forgiving of which just prevents your town from getting bigger whilst the worst could see everyone dead within a few short years. In the beginning you’re focused on 2 primary resources: food and firewood. Building enough houses usually doesn’t take you too long however getting up a store of firewood and establishing a renewable food supply is one thing that’s likely to kill your town in its first winter if done too late. There are several methods to getting this done although my favorite was by far the quad placement of a forester, herbalist, hunter and gatherer which provided a bevy of resources that kept coming in continually. After a while however you begin to notice that the amount of resources required to build other buildings, the ones that will enable you to do more things, can’t simply be gathered anymore and you start needing more people to accomplish certain tasks. This then pushes you towards the dangers of increasing your population at a rate that you can’t currently sustain, quickly showing any flaws you have in your city planning. Typically the first hurdle you’ll face is food as the surplus you generated over all those years starts to quickly evaporate. Then, not too long after, your workers complain of their tools breaking and they start to become inefficient at performing their assigned tasks. Considering one of these tasks is making more tools this can have devastating consequences down the line, wiping out a good chunk of your population because it was all predicated on things getting done in a certain time frame. Once you’re past those initial hurdles though the problems you’ll face become much subtler and can easily go unnoticed for decades of in game time. Indeed my first town that made it past the 20 year mark, which suffered all of the problems I described above, seemed to be struggling to make use of the vast resources I had put before them. No matter how many more people were born I just couldn’t seem to provide enough of everything for them, the parable of Sisyphus running through my head. A quick bit of research showed that my entire town was uneducated and thus would be incredibly inefficient at performing any of their tasks. Including a school now wouldn’t solve the problem for years to come and, with an aging population and a declining birth rate, it was unlikely that would even save my poor town. Sadly I closed that game file and started again. What followed has been a mildly successful town, reaching 300+ citizens in under 50 years with a surplus of food at almost all times with maximum happiness and a mostly educated population. The same problems propped up again of course however this time around I was able to head them off before they became too much of an issue. However new problems arose simply from the size of the population I was now dealing with and small decisions or events, placing a house in the wrong spot or a teacher dying, had effects that I couldn’t fathom. There are solutions of course but these are the sorts of things that you just don’t think about when you’re starting out and solving them can sometimes be more costly than just living with it. For the most part Banished avoids some of the more major issues that have plagued other city building games however there still seems to be times when things go awfully wrong for no apparent reason. The screenshots above shows one of my population (one of many, unfortunately) taking a trip down to the bottom right corner of the map for no particular reason. This wouldn’t be an issue, tyipcally, however many of the people who embarked on this trip would come back cold, hungry or simply die on the way. Additionally whilst you’re able to dictate a number of people to a job you have no control on who does what job, sometimes leaving you with people travelling long distances to do work. You can fix this by removing all your workers and re-assigning them every so often but it feels like a solution to a problem that shouldn’t exist. 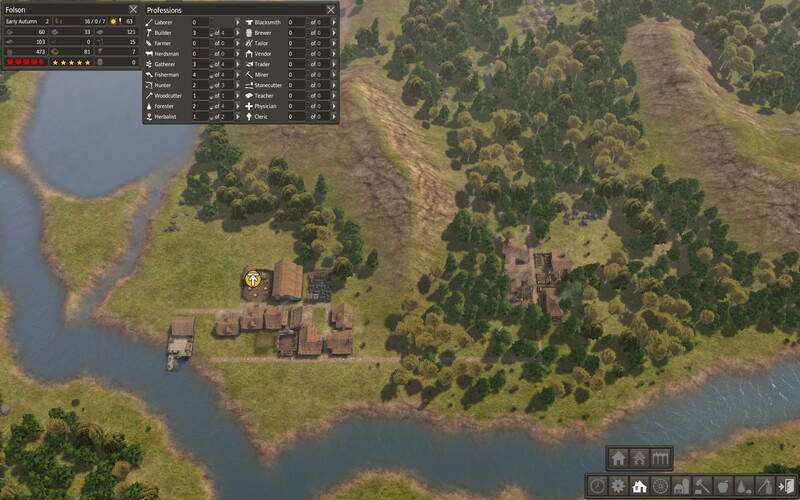 I was really surprised by Banished as when I first looked at it I figured it would be a couple hours of fun figuring everything out and that’d be it. However the initial simplicity belies the greater complexity that lies underneath everything, something which is only revealed to you the longer you play Banished. It has its flaws and once you get past a certain stage there’s a definite feeling of “playing the waiting game” so you can progress to the next stage but it’s hard to fault Banished for that when it managed to draw me away for so long. You’ll definitely need to enjoy the city building genre to really appreciate Banished but that’s about the only barrier to entry I can think of. Banished is available on PC right now for $19.99. Total game time was approximately 15 hours with 17% of the achievements unlocked. Reus: I Shall Shape The World For You, Little Humans. Some of my earliest gaming memories come from city building simulators. I can remember sitting behind my desk at home, glued to the monitor as I struggled to build my fledgling city up in the original SimCity so that I could beat my friend who was doing the same. Our school even had a computer for the kids to share, giving us a precious 30 minute block every so often which nearly all of us would spend playing SimCity 2000. The idea of strategy was utterly lost on me at that point as all I really wanted to do was build the biggest buildings leading me to abuse the porntipsguzzardo cheat endlessly. I still have something of a soft spot for these kinds of games and Reus, a title which I had had my eye on during the Steam Summer Sale, evoked enough nostalgia that I couldn’t help but give it a go. You have been asleep for a long time planet and your surface has become barren, devoid of all notions of life. With the strength that you have left you summon forth your 4 giants of creation who are then set to task covering your land with plants, animals and riches. Soon humans began to return, nomads who had been wandering the dusty plains endlessly began to settle on the fertile land your giants created and began working on great projects to exploit the resources you laid before them. However the humans’ lust for more power often turns them against each other, and sometimes even you, necessitating swift action to teach them humility once again. Soon you grow weary and it is time to slumber once again but will the work you’ve done allow life to flourish without your hand? Reus is a beautifully styled game with its bright color palette, cute animations and wonderful music. The style is reminiscent of flash games of yore although with a truckload more polish than any of those titles ever had. The style of game is also similar to an iOS title I remember my wife playing a long time ago called GodFinger, although thankfully devoid of the awful social features and limitations that came along with it. 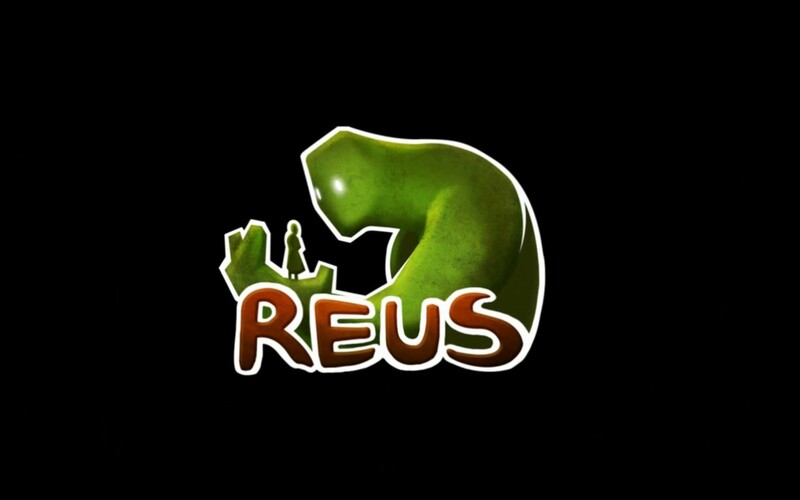 Reus is also only been released on PC so far, Linux and Mac ports are in the works, but I wouldn’t be surprised if I saw it on iOS eventually as it seems pretty well suited to that interface. On the surface Reus is a deceptively simple game. Much like city builders of the past you start of with a land that doesn’t have anything in it but you’re given the tools to shape it as you will. 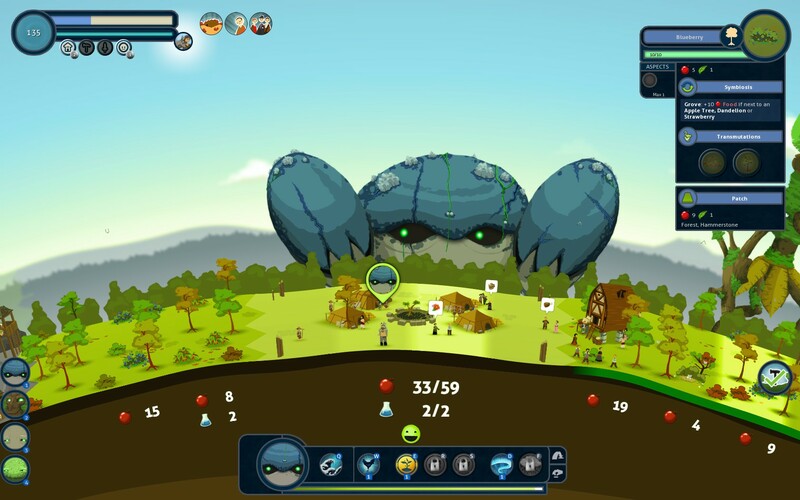 Your ocean giant can create vast oceans which saturate the nearby land with water allowing your forest and swamp giants to create their respective types of land on top of it. Whilst the capabilities of your mountain giant would then seem obvious raising mountains actually results in desert on either side of it. Each of the different types of land results in a different set of resources that you can place on them and also influences what kind of town will settle there once you put some resources down for them. 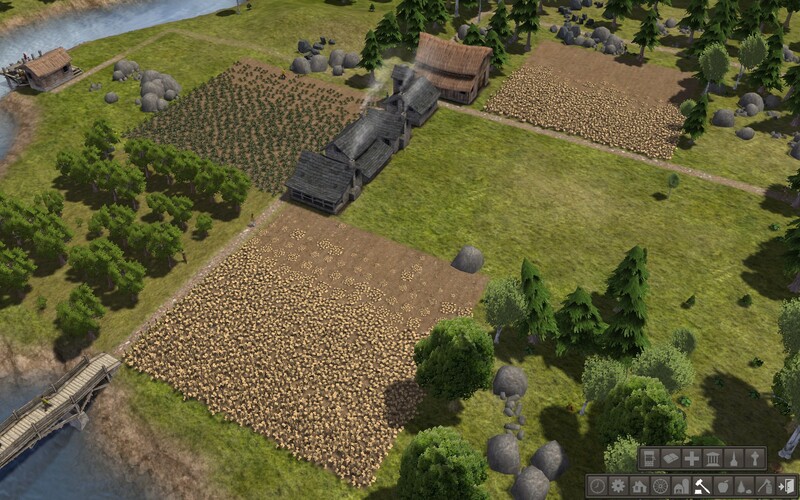 There’s 3 different primary resources that you’ll strive to create in the game: food, technology and wealth. 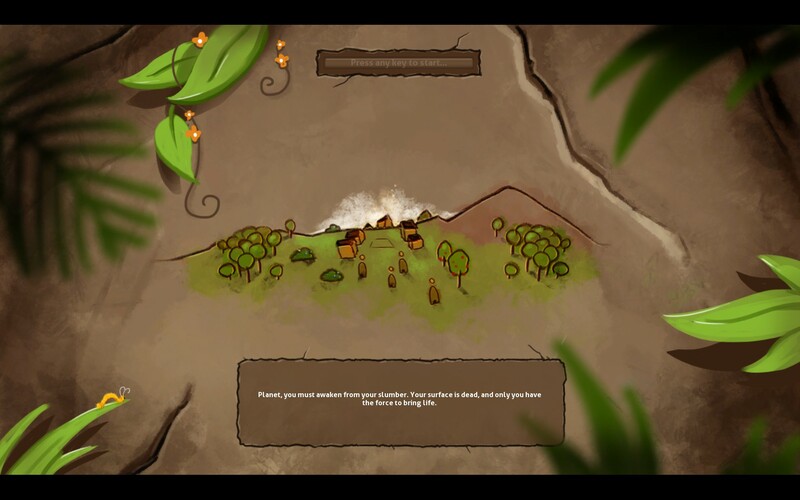 Each of the different types of settlements have different priorities for what kind of resource they’d like (forest = food, swamp = technology and desert = wealth) which gives you a guide to the kinds of resources you should be placing. Those resources are placed by your giants and each giant has their own selection to make use of. 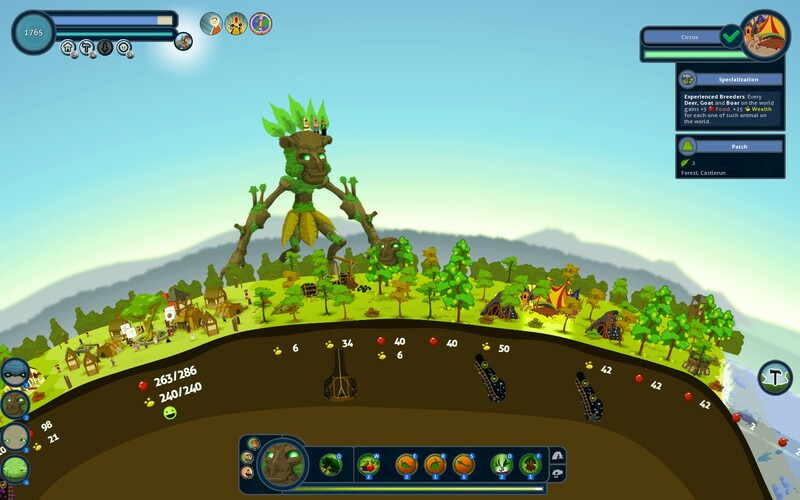 The ocean giant can place domesticated animals, the mountain giant precious and advanced minerals, the swap giant exotic animals and herbs and the forest giant can plant fruit trees. Each of these generates a specific type of primary resource and will differ dramatically depending on where they’re placed. In the beginning it’s pretty simple, you pretty much just use the giant that’s directly associated with that land type in order to create the resources required for the town that’s settled there. You’ll need to do this as the town creates developments which are essentially projects that, when completed, grant the area a bonus to those resources as well as granting you one ambassador of that type of town. These ambassadors then unlock further abilities and upgrades of your giants, allowing you to do a lot more with the same amount of land. Once you’ve got a few ambassadors though they’ll stop being granted for the easy projects and so you’ll have to work the harder ones to get better upgrades. Then there comes the synergies as when certain resources are placed next to other certain resources they will get a bonus to resource generation which becomes key later on when you’re trying to reach the high amounts of food required to achieve the next development. This is where the complexity of Reus really starts to come through as the tech trees that drive all of this are horrendously complicated, to the point where after the amount of time I’ve spent with it I still don’t know anything past the second tier. The wiki can help you with this of course but that will mean a lot of pausing to figure out what the ultimate resource combo is in order to create the resources you require. Indeed this is what I ended up doing towards the end as otherwise I found myself replacing resources far too often, wasting precious time. At first I simply tried to meet the various resource goals of my towns so that they’d complete their projects. However I found later, more advanced projects seemed to require more space than I had access to which frustrated me. However this was an artifact of the way I was playing as you can’t just have 1 town of each type and get very far in the game because you just won’t be able to generate the required number of ambassadors to unlock the upgrades you need. Indeed the best tactic I found so far was to have 2 of each and whilst this does make the micro management of these economies a little insane it is the fastest way to get the upgrades you need which then allows you to get more upgrades with the more advanced projects. If there was one piece of advice I would give to anyone looking to play this it would be to go straight for the Tier 2 resources on all your giants first as once you have that the rest of the game becomes quite a bit easier. Reus is for the most part glitch free although I did have one incident where my forest giant got stuck doing something on a mountain and just refused to move. I could move all my other giants however so there was something weird going on. Saving and reloading fixed the bug however which I was quite thankful for given I was 51 minutes into a 60 minute game. Apart from that the only other gripe I have is that when your giants are close to each other sometimes it can be a little hard to select them by clicking on them as Reus has a tendency to keep the one you have selected rather than switching over. This can be worked around by using the portraits instead but I guess the habit of clicking directly on things is just ingrained in me from all my RTS gaming. I’ll be honest and say that I didn’t get Reus at first as the mechanics, whilst simple enough to begin with, rapidly evolved into something much more complicated than I had first expected. However after experimenting around with different builds I finally figured out the resource tiers and some of the more rudimentary synergies and suddenly everything clicked, allowing me to complete project after project without the struggles I had before. Whilst it hasn’t drawn me in enough to want to slog through the 123 achievements it has it’s still a great game to pass some time and one that rewards players who dive deep into its mechanics to find the ultimate resource combinations. Reus is available on PC right now for $9.99. Total game time was approximately 6 hours with 39% of the achievements unlocked. 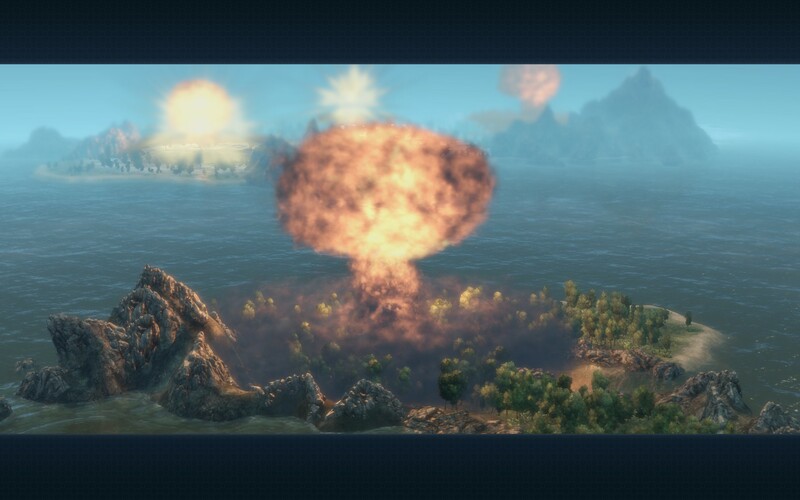 Anno 2070: An Ever Balancing Equation. I’ve never been much of a fan of city building and strategy games. I mean sure I grew up playing games like Sim City and Age of Empires much like the rest of my generation and I’d be lying if I said I didn’t enjoy them, but as time as went on I found myself playing less and less of them, instead favouring other genres. I think this is due to the somewhat slower game play style, one that favours a decisive methodical approach that’s usually at odds with my “just entertain me” thought pattern. Still Anno 2070 managed to catch my eye with its curious blend of city building and real time strategy, something I hadn’t really come across before. 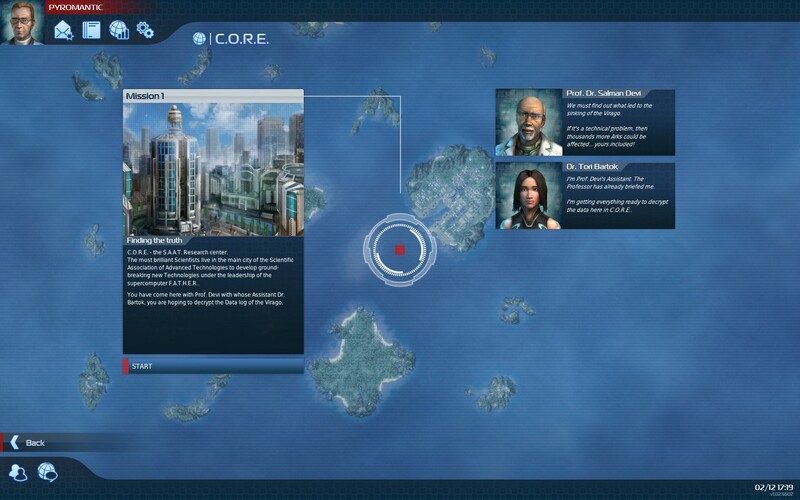 Anno 2070 puts you far into the future where the polar ice caps have melted, flooding the entire world. Because of this the world has united under one singular government with three distinct factions. The first is the Tycoons, a capitalistic consortium that look to rebuild the world as fast as possible regardless of the consequences. The second is the Ecos, an environmental movement who share the same goal as the Tycoons but favour sustainable approaches over expansion at any cost. Finally there’s the Techs, in essence a group of scientists who develop much of the technologies that power both the Tycoon’s and Eco’s economies. You are put in charge of an Ark, an advanced submersible craft that’s capable of restarting civilization on the uninhabited islands of the world. Anno 2070 follows your adventures as you rebuild civilization and do battle with the various problems that cross your path. The graphics of Anno 2070 are visually pleasing to say the least, providing a level of eye candy that I haven’t seen in this genre before. Much of this owes to the soft glow that seems to surround everything, giving a soft blur that makes the graphics appear much better than they actually are. The camera work done for the cut scenes in Anno 2070 is also quite good with many scenes having a distinct movie feel to them. As an added bonus all this doesn’t seem to put too much strain on my gaming rig as even when I had hundreds of buildings on screen the game was still buttery smooth, something that the developers behind Anno 2070 get a lot of brownie points for. However Anno 2070 falls into the lazy trap of nothing bothering to do any kind of lip syncing at all, not even for the voice acted parts. This really irks me as it’s not exactly a hard thing to do and Anno 2070 just doesn’t even bother, the characters just randomly flap their mouths while the sound bite plays. You may think this is being overly harsh but I watched my friends almost a decade ago accomplish near perfect lip syncing when they were doing a 3D animation course. When a game doesn’t bother to do this I can’t help but feel they had lazy animators, especially when there’s not that much more animation in the rest of the game. The voice acting, whilst passable, doesn’t really help matters here either. As I alluded to earlier Anno 2070 is a curious blend of Sim City/Civilization city building style mechanics coupled with elements of real time strategy. The campaign missions serve as a good introduction to these mechanics, introducing each of them slowly so you can get a feel for them, and after the first couple missions I had a pretty good grasp on what I needed to do. The two different genres are heavily intertwined, as I’ll explain below. The first part is the city building. You start off by dropping a warehouse on an island which gives you an area to construct non-residential buildings in. After that you can then drop a community centre which allows you to build homes for people to live in. These people have needs which take the form of food, drink, community and so on. Should you satisfy all their needs the buildings will then upgrade to the next level of citizen, one that has more nuanced needs but also generates more income for you. There are 4 distinct levels for each race and each level brings with it new buildings that are bigger and better than their previous ones. However you’ll never be able to find everything you need to get to the highest levels by using just one island. All of the islands have natural resources on them that can be exploited but its guaranteed that one island won’t have everything you need. That’s when ships and trading routes come in, you can use them to ferry resources between islands. At the same time you’ll probably want to expand your population there, because otherwise you won’t be able to pay the upkeep on the ships. Of course those people have needs to, which the island probably doesn’t have, so you’ll have to use those same ships to start ferrying resources to them as well. It’s really quite incredible how much effort you have to put in to make sure everything stays balanced so that you don’t run out of money or that you residents leave you. In the one multiplayer game I had with a mate of mine it was an intense 4 hour session of bouncing between islands ensuring that all the needs were met, ultimately unraveling before me as I underestimated just how costly satisfying the highest level resident’s desires would be. We didn’t even get to the other part of the game, the real time strategy component. Whilst the main focus of Anno 2070 is the city building the RTS side of it is just as important if you’re looking to win. Whilst its not as complex or nuanced as say StarCraft II it can’t be ignored either as one combat ship can make you life rather painful if left unchecked. The final missions of the campaign focus heavily on this and whilst you won’t be spending all your time focusing on the combat it’s still enough to break up the monotony of constantly balancing the needs of your populace with the costs of doing so. On top of all of this is the ancillary activities which can change the way you play your game. There’s regular votes for the world council with the outcome granting certain bonuses. A World Event is always happening that will reward players who complete it based on the number of people who participated in it and there are Current Events that can be completed for rewards from certain factions. For someone who’s a fan of the Anno series or just this instalment this kind of thing would be a veritable gold mine of additional content, further extending the replay value of Anno 2070. Anno 2070 represents an interesting fusion of genres that you don’t usually see coming together and manages to pull it off surprisingly well. With the pleasing graphics, intricate game play and wealth of content Anno 2070 is definitely one of those games that won’t disappoint traditional PC gamers. The experience isn’t perfect however, what with the terrible lip syncing and ridiculously long play times for multiplayer games. Still for the price I paid I’d consider it a winner and I can see it being busted out at LANs for those looking for a Civ style fix without the minimum 8 hour time commitment. Anno 2070 is available right now on PC for $20.99 (or $90 on Steam). Game was played entirely on the PC with around 16 hours of single player and 4 hours of multiplayer.